2014 Mitsubishi Mirage vs. 1998 Chevrolet Metro: Which Gets More MPG? 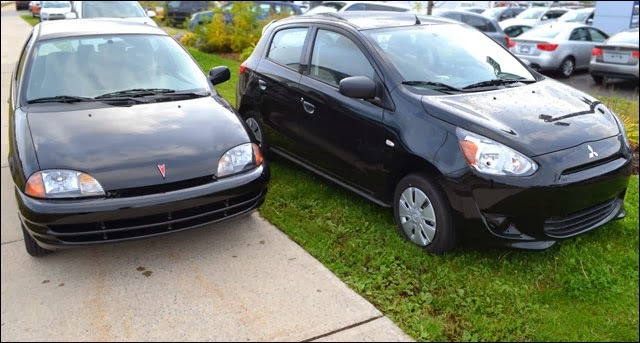 Ok, technically, it's a 2014 Mitsubishi Mirage vs. a 1998 Pontiac Firefly—the Canadian version of the Metro—but still. Darin Cosgrove owns both the Modified Metro and is the co-founder of MirageForum.com. He put together a comparison of these two tiny three-cylinder fuel misers to see which would get better fuel economy: the iconic-for-economy Metro or new three-banger-on-the-block Mirage. I won't provide any spoilers (no car pun intended), but there are a couple of things to consider: The Pontiac Firefly is modified to get better mileage, however, it's also 15 years old. Be sure to check out the link below to see which car wins. Just test drove a Mirage. My current is 2012 Yaris. The Mirage is very good for the price with the auto climate control, power windows, locks standard. The instrument cluster is where the Miarage is lacking. It just looks cheaper, it is missing an analog fuel gauge. Also the trip computer screen is smaller and does not provide real time mpg consumption, just the average. I would say the trunk is bigger on the Mirage as well as deeper. It would also appear that it gets slightly better mpg's too. As many reviews mentioned, the wind noise is very noticeable on the highway. If that and the instrument cluster were a little nice it would be a sure buy for me. Agreed: considering the car's mission as a fuel miser, the "ECO" idiot light isn't nearly as useful as an "instant" fuel economy readout would be.